This time of year, weather permitting, you’re in for a treat: the morning moon. You can spot the moon by looking up high in the west when you go outside in the mornings. The late (past-full) moons of late summer and early autumn follow a track across the sky that makes them easy to spot throughout the morning, and often well into the afternoon. On September 1st, the last quarter moon will be passing in front of Taurus, a part of the Zodiac that is very high in the Northern Hemisphere, and that moon will be just about directly overhead right around the time you start your breakfast…see for yourself! The term “last quarter moon” can be confusing. It’s not that you’re seeing only 1/4 of the moon, but rather that you’re seeing the moon in the last quarter of its cycle. What you will see is a half moon with a curve towards the east/left. As long as the weather cooperates, you’ll be able to see this moon start to swing down to the northwest after lunch. In astronomy, there’s the idea that “Everything is its own opposite.” This idea isn’t as complicated as it may first seem. For example, when you see a full moon, it’s in the part of the sky where the sun will be six months and twelve hours later. A summertime full moon is pretty low, regardless of what hemisphere you live in, and it marks the spot where the sun was back six months (and twelve hours) ago in winter. And, in comparison, a full moon in winter is in the part of the sky where the sun was six months (and twelve hours) ago. It’s the same with the first-quarter and last-quarter moons. For example, the last-quarter moon that you see overhead on the morning of September 1st here in the Northern Hemisphere is in just about the same part of the sky that the first-quarter moon will be in six months and twelve hours time: half a year and half a day away. Actually, daytime moons – early rising and late setting moons – can be spotted lots of times during the year, if you know where to look and when. Your local newspaper should give moonrise and moonset times for your region. For me, daytime moons, particularly “High-Morning Moons” always have been favorites, and I hope you enjoy them too! 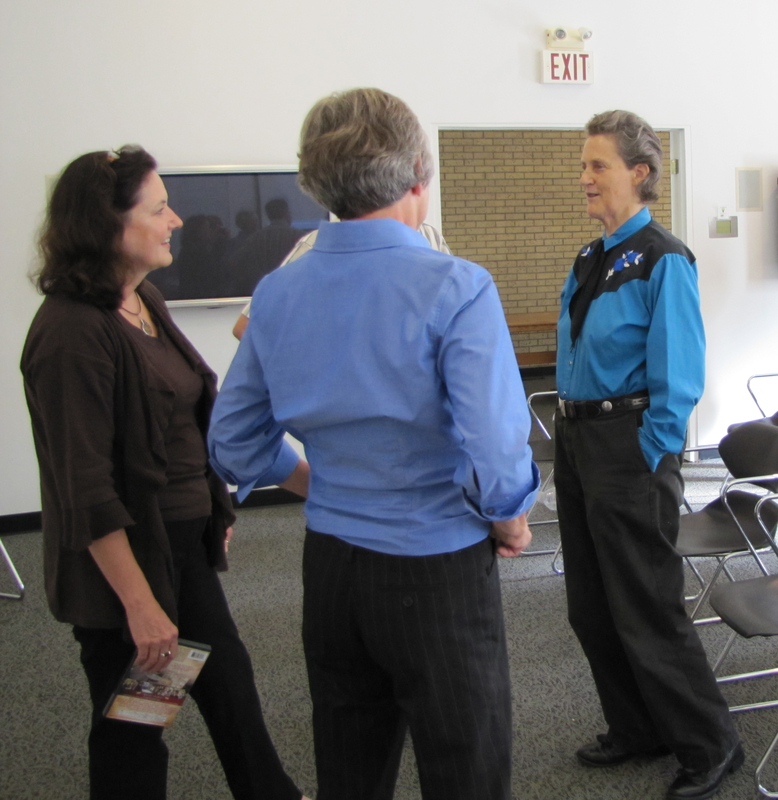 History Mystery Registration- Last Call! For you last-minute slackers (sweet and well-meaning though you may be), Thursday (August 26th)* is the deadline to register your team for this Friday’s History Mystery Challenge. Come and compete in a 90-minute race of a scavenger hunt throughout Old Town. Who will solve the most clues? Who will be sure to enjoy the yummy hors d’oeuvres and beverages? Who will walk away with our oh-so-cheesy door prizes? All the registration information for The Fort Collins Museum & Discovery Science Center’s 2010 History Mystery Challenge can be found here. See you on Friday! For coverage of last year’s Challenge, read on here and here. *The original deadline was Wednesday, August 25th. But we love you so much, we’re giving you an extra day. From the Archive: Double the Fun: Cherry Pie for Two! 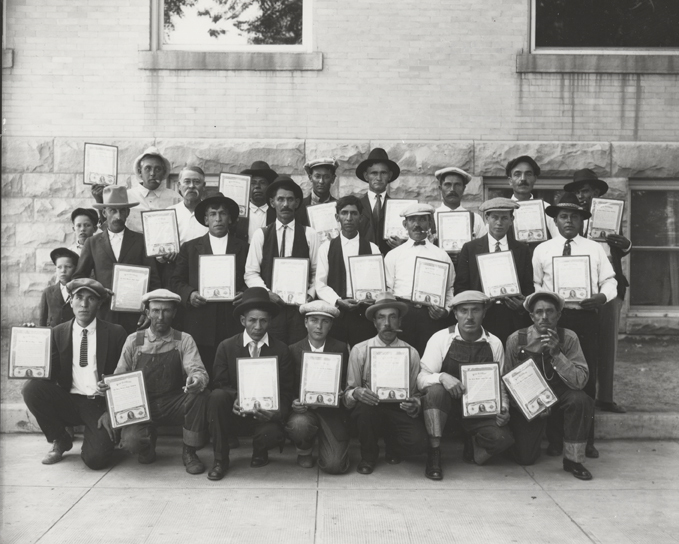 A recent museum staff recent pie baking competition got me thinking about pie contests from the past. 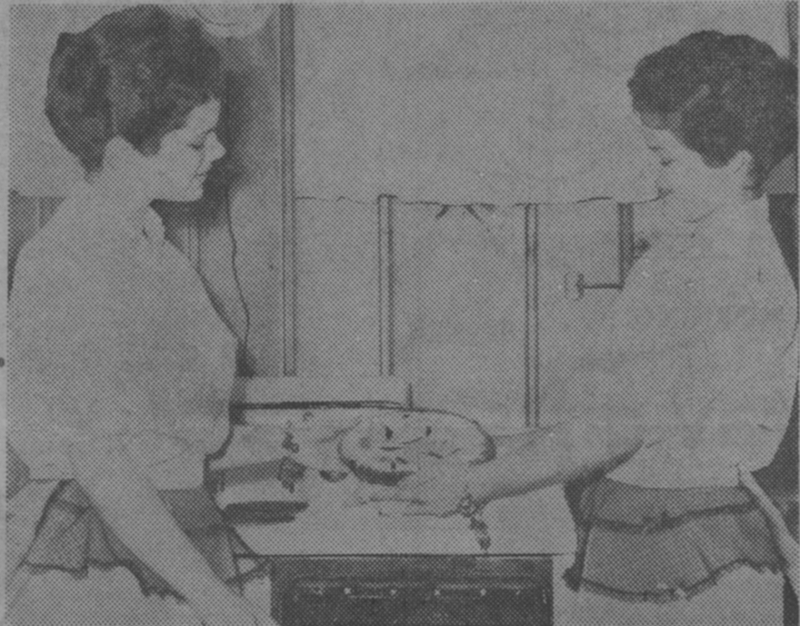 In the archive, we have a series of newspaper articles, pamphlets, and recipes for local and national cherry pie baking competitions from the 1950s. Twins Karen and Sharen Smith of Loveland were involved in the local competitions and featured in multiple newspaper articles. Their mother, Helen Smith, arranged the local and state contests and served as the secretary of the Loveland Canning Corporation. Their grandfather, J.W. Berry, was the director of the National Red Cherry Institute which sponsored the annual national Cherry Pie contest in Chicago. It seems that cherry pie baking was in their genes! Here are Karen and Sharen at age six at the state contest held in Loveland. At age nine, Karen and Sharen were photographed in the newspaper again. As you can see, they are still chomping on cherry pie. The twins were finally able to compete in the state contest at age seventeen. They had lots of preparation and practice prior to the contest. 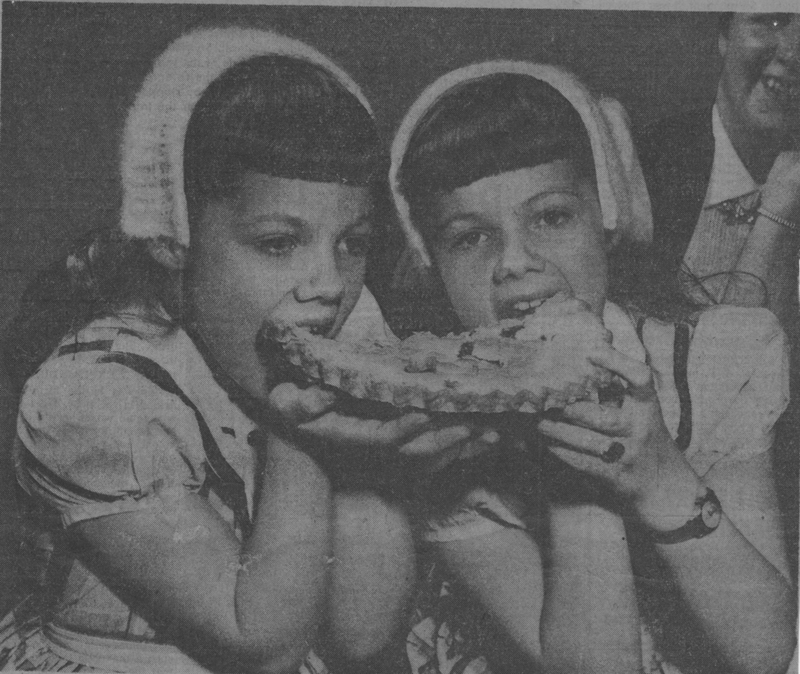 Not only did they spend childhood years attending and acting as unofficial taste testers at the contest, they also spent a whole summer baking and selling pies. The sisters were stationed just west of Loveland on Highway 34 and sold about thirty cherry pies a day. After baking a total of 2,250 pies in one summer, they should have perfected their cherry pie baking techniques. 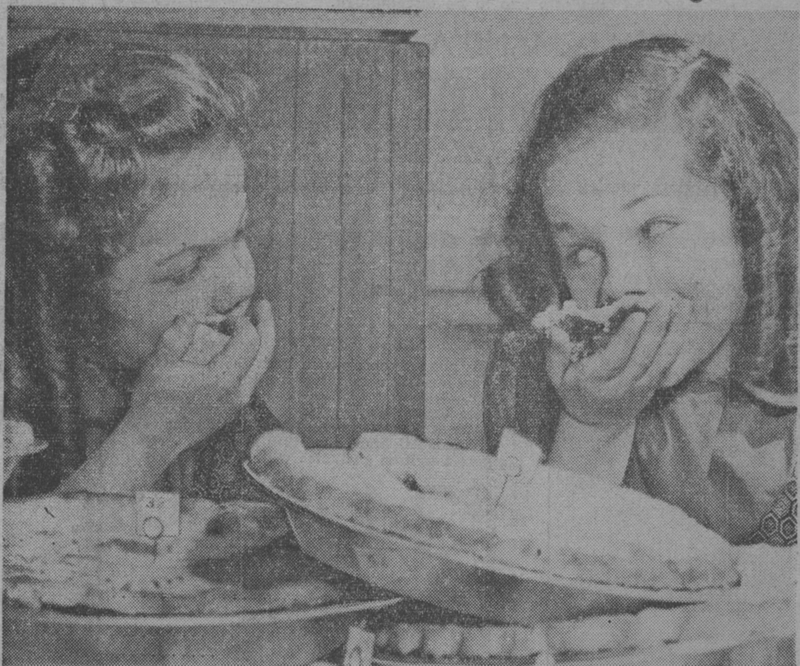 This newspaper photograph shows the twins again, but they are no longer eating pie; instead they are showing off their scrumptious creation prior to the competition. Meet Triceratops, a dinosaur with three horns and a short frill on its head. Meet Torosaurus, a dinosaur with a large, two-holed frill on its head. Since the late 1800s, paleontologists thought Triceratops and Torosaurus were two separate species. But now, some paleontologists think that Torosaurus is just an old Triceratops. After studying dinosaur skulls for years, paleontologists John Scannella and Jack Horner at Montana State University noticed something strange: Triceratops skulls were always from younger individuals, and Torosaurus skulls were always from older ones. The fossil record is spotty, but probably not so spotty that no individuals of a specific age group would ever appear to be preserved. Unless, of course, the species’ appearance changes so dramatically as it grows that a juvenile and an adult of the same species look like two different species. This isn’t a new idea in science; in fact, it happens a lot. Think about caterpillars and butterflies, tadpoles and bullfrogs. Because we’re able to observe these animals developing, the extreme physiological changes (though still surprising and fascinating) make sense. Dinosaurs and other prehistoric organisms can only be observed through the fossil record, which makes understanding physical changes from birth to death much more difficult. Scannella and Horner examined Triceratops and Torosaurus skulls from museums around the world, and found evidence that Torosaurus may be Triceratops at later growth stages, rather than a separate species. The researchers measured skull length, width and thickness, and also examined the microstructure, surface textures and shape changes of the frills. These analyses revealed that the Triceratops and Torosaurus specimens came from the same species and that tissues of Torosaurus were heavily remodeled compared to Triceratops, which is what happens as bones continue to grow. Left: Younger Triceratops; Right: Older "Torosaurus"
So what’s going to happen to Triceratops and Torosaurus now? Well, if continued research provides sufficient evidence to convince the scientific community that Triceratops and Torosaurus are one and the same, the name Triceratops, which was coined before Torosaurus, will be applied. Thank goodness; I’m still coming to terms with the demotion of Brontosaurus!